Sacramento History: What is...and isn't...a trolley? This article in Monday's Bee on the ongoing plans to build a streetcar line between Sacramento and West Sacramento prompted quite a few comments. One thing I notice is that, for many people, it isn't at all what a streetcar, or a trolley, is. The term "streetcar" refers to fixed-rail transit that is run on city streets, rather than on separated grades like a railroad. The term was originally used to describe horse-drawn cars operating on rails, but can also cover cable cars, steam dummies (small steam locomotives intended to pull cars on city streets) and electric trolleys. Because horse cars, cable cars and steam dummies were all supplanted by electric trolley cars, the terms "streetcar" and "trolley" are pretty much identical. The term "trolley" comes from the pole used to connect an elevated high-voltage power line to an electric vehicle. One of the earliest prototype electric streetcars had a four-wheel device that hung from the overhead wire, connected via a cable to the car, referred to as a "troller," is probably the origin of the term. Trolley poles came in various forms, using either a wheel or a shoe at the end of the pole to ensure good connection to the wire. Trolley vehicles normally run between 24 to 50 feet: about the size of a modern bus, but generally wider. Speeds vary, but for the most part trolleys run at 20-40 miles per hour. That being said, what ISN'T a trolley? This is not a trolley. This is a bus. 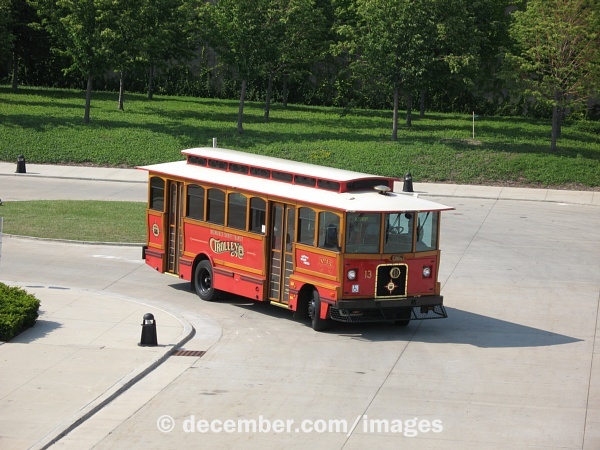 People have frequently suggested a "test run" of a trolley system by trotting out one of these instead, or they argue that a trolley system won't work because the RT bus-that-looks-like-a-trolley is seldom crowded. The problem is, this ISN'T A TROLLEY. It is intended to look like a certan type of trolley, if you kind of squint, but it fails for several reasons. For starters, it's still a smoky, noisy bus. Second, it runs on wheels instead of rails, and therefore doesn't run as smoothly. Third, because it has no fixed path, its schedule and route can change at the whim of the operating company, thus it gives little security to land developers who want to encourage transit-oriented growth that the transit won't vanish in the next fiscal wind. Finally, this isn't a trolley because "quaintness" is not a required feature of a streetcar. Modern streetcars (and even some historic ones) aren't necessarily long on charm, wood paneling or quaint design (even though many of them are.) They're a vehicle built for a purpose, and the purpose isn't to look cute (even though many of them do): they exist to move people. This isn't a trolley either. This is a light rail vehicle. Many people assume that LRVs were the modern version of trolleys/streetcars. They are wrong. LRVs are intended to run primarily on private right-of-way rather than city streets, are typically 60-80 feet long and intended to run as multi-unit vehicles, are capable of higher speeds (up to 50-70 mph) and are intended for inter-city and suburban service. They are the historical replacement for the interurban, which is a type of transportation virtually unknown in modern society. Interurbans operated like LRVs do now: they run on streets in cities, but their real strength is in open country and private ROW where their larger size and faster speeds aid commuters. But a city trolley isn't intended to do that. The classic example people think of when you refer to trolleys is the Pacific Electric (aka the "Red Car") of Los Angeles and Orange County, but that was an interurban system. Streetcar service in Los Angeles was covered by the Los Angeles Railway (aka the "Yellow Car"), a physically separate system (originally a cable car system, they operated on 3'6" cable car gauge instead of standard 4'8/5" gauge) owned by the same person (Henry Huntington.) Why would Huntington, a financial wizard on a par with his uncle Collis P., operate two "redundant" electric railroad systems in the same area? Because he realized that they served two distinct and separate roles! LARY streetcars moved people around in downtown Los Angeles and adjacent neighborhoods: PE interurbans moved people around throughout the greater Los Angeles area, in between cities. So, some of you might be asking: What DOES a streetcar look like? Thank you. I have been wondering how to describe the difference between the streetcar (on the street, eh?) and the light rail (on separate right of way mostly). Is Caltrain in the peninsula an example of "interurban"? And, if not, where does Caltrain fall in the pecking order? Generally, interurbans were electric. BART works like an interurban, for example. Light Rail is really just a short interurban. Diesel/steam trains carrying short-haul passengers, like Caltrain or the Capitol Corridor, play a similar role, but normally they're known as commuter trains rather than interurbans, and often they cover a wider territory: the Chico/Sacramento/Oakland run of the Sacramento Northern's "Comet" and "Meteor", for example, was the longest run of any single interurban line in the country at 187 miles, although the PE had more total track. A pejorative term used by trolley fans to describe these hybrid buses is "trollop." words have power, but knowing when distinctions are meaningful or not can be hard to navigate. in this case, you chose a good defining line that actually serves some purpose, other than semantics...and i now have another fun word in my toolbox, "trollop" to use for those hybrid buses. Streetcars first, with tracks, then trolley WITH electric power from a side pole, thus the name. As you pointed out, the vehiucle may LOOK like a trolley, or it may go on RAILS on a street in a fixed ROUTE liuke a trolley..but it MIGHT not BE a trolley!!! Happy Easter, and one person who knew about both Easter AND Trolleys was the late, lamented, legendary Judy Garland.